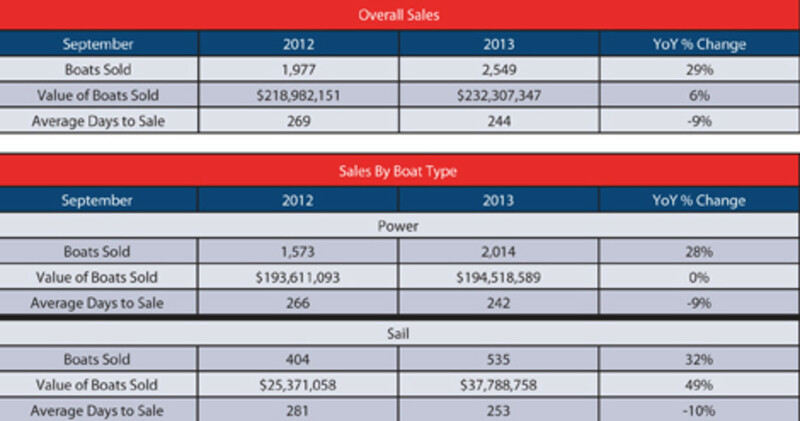 In September, for the fifth month in a row, U.S. brokerages reported a significantly higher volume of sales than in 2012 as 2,549 boats were sold. Sales were up 29 percent from the 1,977 boats sold in September a year earlier, and they also were more than 350 boats ahead of the five-year sales average for the month, according to YachtWorld member brokerages recording their sales in Soldboats.com. Although the bulk of the market — 45 feet and under — continued to show strength with gains of 21 to 37 percent, the top end had slower and/or lower-value sales, which held back growth in the aggregate price paid for boats sold during the month. The total value of boats sold in September was $232.3 million, up 6 percent from $219 million a year earlier. With 29 percent growth in unit sales, the volume gains outpaced value by a large margin. Among powerboats, the dichotomy was pronounced: 2,014 boats were sold, a 28 percent increase, but the aggregate price paid for them was virtually flat, at $194.5 million. By contrast, sailboat sales were up 32 percent, with 535 boats sold, and the total price paid rose 49 percent, to $37.8 million. In the superyacht category of boats over 80 feet, sales were down from 11 boats to 9, with a total price paid of $26.5 million, down 37 percent from $42.1 million in September of last year. In the 56- to 79-foot range the story was similar, with sales dropping from 55 to 51 boats (7 percent) and total value declining from $37.8 million to $31.7 million (16 percent). Among boats 46 to 55 feet, demand was strong as unit sales rose from 116 boats to 149, a gain of 28 percent, but the total price paid climbed only 3 percent, from $36.2 million to $37.2 million. Demand also was strong for boats 36 to 45 feet, as 573 were traded, a 21 percent increase, and the total price paid rose from $53.1 million to $69.5 million, a 31 percent gain. Increases were similar among smaller boats. In the 26- to 35-foot segment, 1,038 boats were sold, up 37 percent, with an equal percentage gain in value, to $51.8 million. In the under 26-foot grouping, sales were 29 percent higher, at 729 boats, with a 31 percent increase in value, to $15.6 million. Through the first three quarters of this year, YachtWorld brokerages reported 25,532 boats sold, a 5 percent gain from 2012. The gain in the aggregate price paid was 21 percent, from $2.45 billion to $2.97 billion. Although the power and sail segments had very different results in September, they are up 5 to 6 percent in unit sales for the year and have seen an increase of 21 to 22 percent in the total price paid.